Angkor Thom, whose name means "The Great City," was the capital of the Khmer empire from the time of Suryavarman I (1002-1049) to the end of the Classic Period (c. 1327). In its present form, the city dates mostly from Jayavarman VII (1181-1220), with significant additions by Jayavarman VIII (1243-1295). 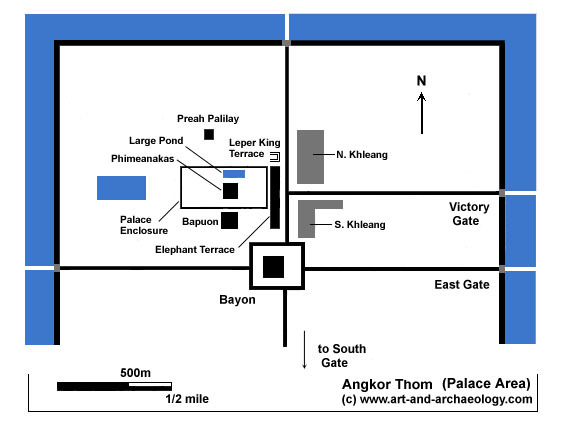 The original nucleus of Angkor Thom was Phimeanakas, Suryavarman's State Temple, which he built at the center of his royal palace complex; the Bayon was built by Jayavarman VII, and so Angkor Thom has, uniquely, two focal centers rather than one: its geometric center is the Bayon, whose axis leads to the Eastern Gate, but equally important is the axis of Phimeanakas which leads east to Jayavarman's Victory Gate. In effect, then, Angkor Thom is two cities superimposed upon each other; Suryavarman's original capital, and Jayavarman's city which overlays, and is centered 500 meters to the south of, Suryavarman's.